It adheres to international standards for representing lexica and ontologies in the Semantic Web (such as OntoLex-Lemon and OWL), so that lexical resources can be shared easily or specific entities can be linked to existing datasets (it is based on the OntoLex-Lemon model, currently regarded as a de facto standard for the modelling and publication of lexical resources as linked data). It provides a set of services implemented by means of RESTful Web Services that allow software agents access to resources managed by LexO. Totus Mundus, a bilingual Chinese-Italian resource dealing with Matteo Ricci’s Atlas. LexO has been used by historians to build the linguistic resources related to the Map; a demo is available here. 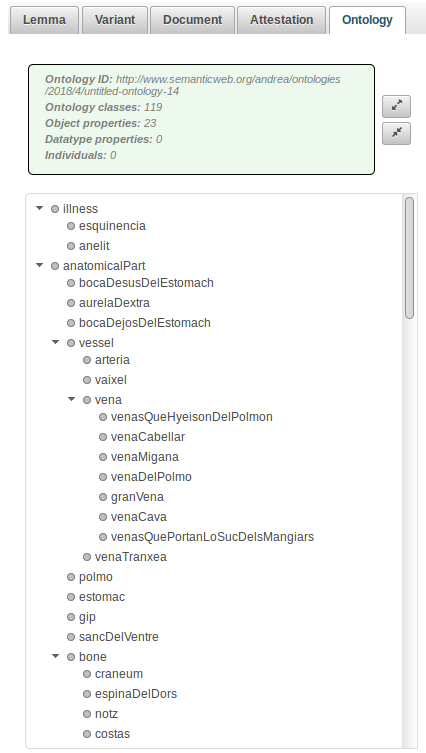 In addition, a demo of LexO with a subset of italwordnet adjectives is available as an online service through ILC4CLARIN. The LexO interface is composed of two main sections (Fig. 1). Depending on which tab is selected, the left-hand side column will either show the list of lemmas composing the resource, a list of word forms, a list of lexical senses, or a list of concepts belonging to a reference ontology. 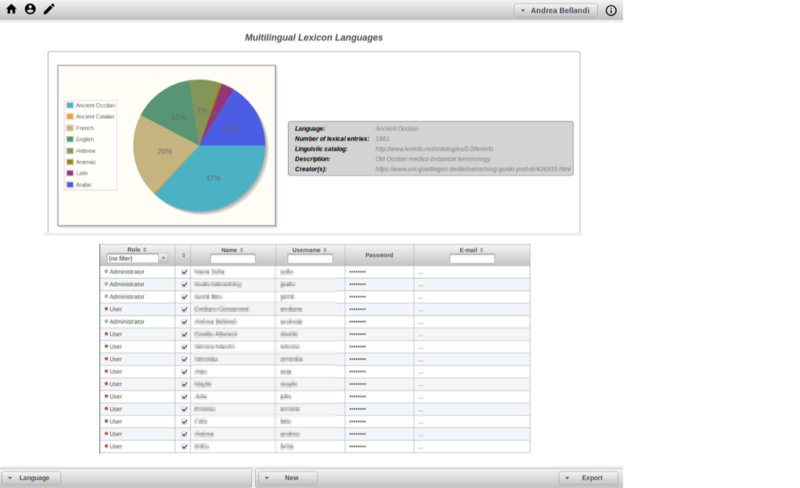 If the resource is multilingual, then users have the possibility of filtering lemmas, forms and senses by language. Information related to the selected entry is shown in the central panel where the lemma appears in the upper part of the leftmost column on at head of a list of related forms. On the right, the lexical senses are shown. Figure 2: Dictionary view of LexO. 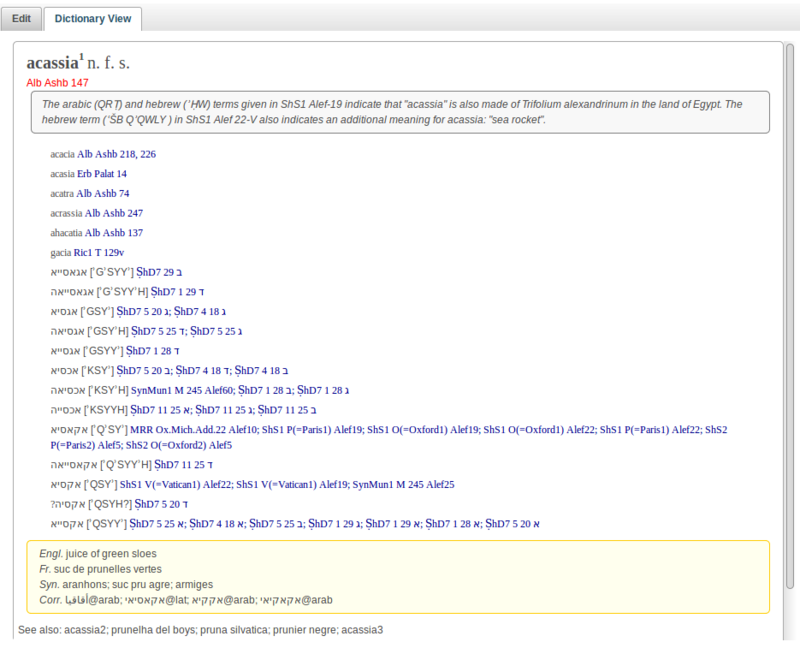 By selecting the “Dictionary View” tab, the central panel shows a dictionary-like rendering of all the information related to the selected entry. When selecting the “Dictionary View” tab, the central panel will show a dictionary-like rendering of all the information related to the selected entry (Fig. 2). At the top of the central panel, a section can be expanded to query the resource, either by filling a series of fields for advanced searching (Fig. 3b) or by composing queries in a controlled natural language style interface (Fig. 3c). A team of users can work simultaneously in LexO to create, modify or delete a lexical entry, form, sense, or to connect an entity to another entity, such as a sense to another sense via the “synonymy” property or a sense to a concept via the “ontological reference” property. 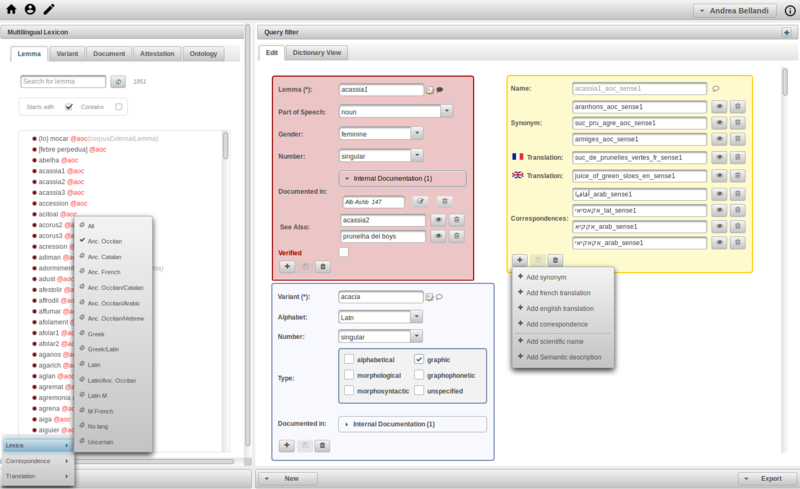 The ontology can be imported using a dedicated tab in the left column (Fig. 3a). Finally, administrators can monitor the lexicon construction process, for example by adding/removing users to the team, monitoring their productivity, and access basic statistics of the lexicon. Bellandi, A., Giovannetti, E., Weingart, A. (2018). Multilingual and Multiword Phenomena in a lemon Old Occitan Medico-Botanical Lexicon. Information, 9(3), 52. Khan, F., Bellandi, A., Monachini, M. (2016). Tools and instruments for building and querying diachronic computational lexica. In Proceedings of the Workshop on Language Technology Resources and Tools for Digital Humanities (LT4DH) (pp. 164-171). McCrae, J. P., Bosque-Gil, J., Gracia, J., Buitelaar, P., & Cimiano, P. (2017). The OntoLex-Lemon Model: Development and Applications. In Proceedings of eLex 2017 conference, September (pp. 19-21).